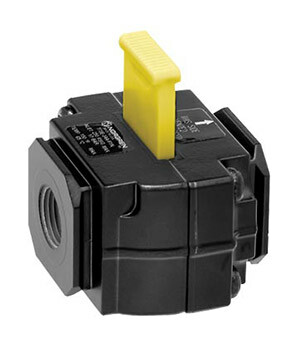 The T72T Series Lockout Valves are designed for use as a single in-line unit or as part of Norgren's Excelon® modular compressed air line preparation supply system. As a modular component, this lockout valve can quickly be attached to air regulators, filters, oilers, smooth start / exhaust valves and pipe adapters. With our Quickclamp® and Quickclamp® and wall bracket accessories, a complete compressed air supply system can be assembled and mounted in minutes. Lockout valves are used to protect people and equipment from accidental operation during maintainance, repair or modifications. They are intended to help conform to OSHA regulations for lockout - tag out programs for control of pneumatic power supply. 참고: All of the above are with PTF threads.